Is there a difference between Game Camera and Trail Camera? What practical things do I need to keep in mind? Is the image quality and range the same during the night? 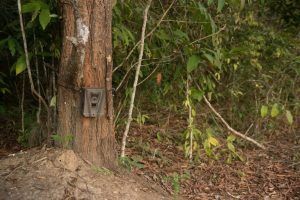 Game Cameras are also known as Trail Cameras and are the same. They are designed specifically to assist you in capturing the target’s picture and location; which is difficult to determine in wilderness. They usually have a detection field of 50- 100 feet. Once installed and set, they sense movement and activate the trigger thereby collecting useful data for hunt without your presence. All trail cameras support night shots nowadays. An LED mounted camera can take colour pictures in the night but the issue is that their bright white flash can spook the animal and blind you for a few seconds as well. If you want your actions behind camera and camera itself to be covert, then go for Infrared invisible flash. However, IR flash will only support black & White pictures in the night. The clarity of images will depend on the resolution of the camera; but a high or low resolution does not make a big difference in night shots. Say, a 10 MP and 12MP camera would take almost similar quality of pictures. Trigger time is the time that a camera takes to capture the shot. It is of vital importance if you have to capture a moving target, which will give you a time of fraction of seconds. The fastest trigger speed in market is about 0.14 seconds only whereas there are number of cameras that have a speed of almost 1 second; which is extremely slow. A slow trigger speed would spoil the picture for most of the part unless it is stationed at a still target. Some cameras come with multiple shot options, which enable more than 1 picture to be taken at a time. This ensures that at least one of the pictures taken at a go will be perfect. There is a marked difference between the day and night shots. The difference can be more or less depending upon the functionality and features of the camera. The incandescent or LED mounted cameras do take clearer and coloured pictures in the night as compared to the infrared cameras; but when compared to the day pictures taken by an IR or incandescent camera, the clarity is far less and colours are a little blunt. The infrared cameras support only black and white snaps in the night that can be little blurry occasionally.